I took pictures for a campaign to raise money for the Lilongwe Wildlife Centre. The pictures were printed on Kelloggs cereals packets in the UK and in Italy. The Lilongwe Wildlife Centre caters for orphaned Malawian animals and tries, whenever possible, to rehabilitate them back into the wild. 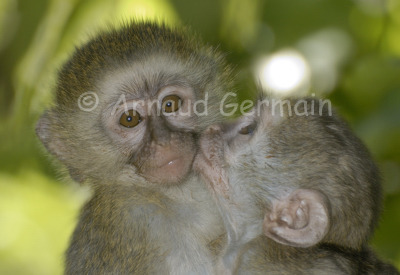 Coco and Pops were two little vervet monkeys that clung to each other a lot. They were obviously very popular and I had to spend quite a bit of time with them. I took this picture on one of my visits to the Centre and the image helped the campaign. I once did a workshop with Andy Rouse, a professional and acclaimed wildlife photographer who said something that stuck in my mind: "Cute sells".